HOUGHTON -- The snowflakes, the beloved Christmas music, the magical tale: Come to the Rozsa Center to experience the timeless Christmas tradition that is The Nutcracker ballet! 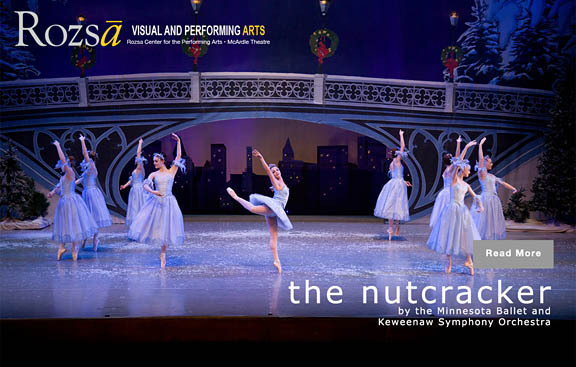 Minnesota Ballet and Keweenaw Symphony Orchestra (with Joel Neves conducting) will present a fully-staged production, with live orchestra, of Tchaikovsky's enchanting Nutcracker ballet at 7:30 p.m. Friday and Saturday, Dec. 4 and 5. The performance is presented with support by Minnesota Public Radio. 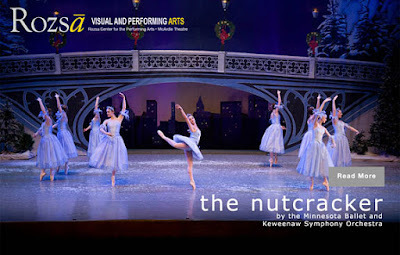 Student dancers from many area schools, including Houghton, Hancock, Baraga, Lake Linden-Hubbell, C-L-K, Michigan Tech, Gogebic CC and others will take the stage to create this magical Christmas fairytale with the Minnesota Ballet and Keweenaw Symphony Orchestra. Tickets are on sale now: $25 for adults, $10 for youth. Special for The Nutcracker performances only, a $55 "family package" includes two adults and two youth tickets. Additional youth tickets can be added on for $6 each. No charge for Michigan Tech students with a Student ID/ Experience Tech fee. Advance reserved seating is now available. Tickets may be purchased by phone at 487-2073, online, in person at the Central Ticketing Office in the Student Development Complex or at the Rozsa Box Office the evening of the performance.